Augmented Reality(AR) is extensively used in games and entertainment and also in various other industries. By leveraging the richness of 3D and IoT we can create compelling augmented reality experiences that help improve efficiencies, build better products and enable safer, more productive environment for workers and customers. AR will be used extensively in many areas in the manufacturing industry. 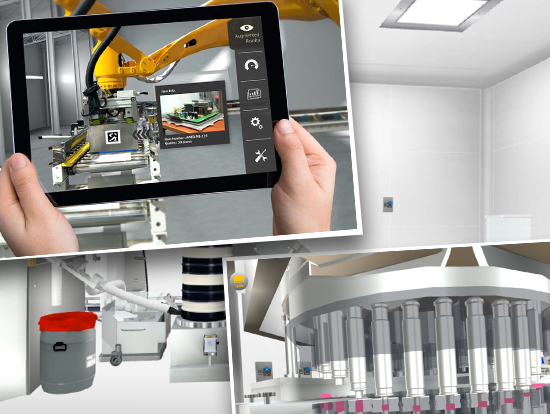 Following are some of the obvious benefits on using augmented reality applications in manufacturing sector. Whether we’re manufacturing toy or jet engines, every product needs to follow a set of assembly instructions. Manufacturing requires putting together hundreds or thousands of components in a precise sequence as fast as possible. For example – In aerospace manufacturing process, assembly assistance are using projectors to show the next part placement. The augmented reality makes different today is mainly size, adaptability, and capability. By going through virtual information portrayed onto real-world engineers can get their work done faster. In terms of assembly, engineers needn’t rely on schematics and can get all the help from AR applications. The AR solution built using Vuforia Chalk will be more powerful and intuitive with remote guidance for the team’s fingertips. This makes both expert and technician can accurately mark up live views to highlight details or guide multi-step solutions. This will reduce the production lead time or machine service turnaround. AR can be used in training just like VR where the employees can learn intricate concepts easily with vivid representations. Without fearing rebuke and mistakes, on-the-job training can be carried out effectively. Let’s see where all AR is actually used in real world industrial manufacturing process. The assembly process requires careful working and assembling hundreds of parts correctly and in a very fast manner. Usually this information is made available in a technical document pdf which is very lengthy, static and monotonous. It is quite hard to read and understand the do and don’ts of various assembly processes in a textual format. Companies often require separate individuals who can interpret and write such documents. With the use of AR, all this process can be made easy and interactive. Lengthy information can be made available in a very vivid way that AR representations usually do which let the employees better engage and understand the critical assembly process. Step-by-step instructions can be delivered via an AR headset that lets the assembly process to operate faster and effectively respond with the latest information. Manufacturing companies using augmented reality to manage and repair machines and equipment involved in the manufacturing process. Instead of using a manual to find issues and then take appropriate actions AR can greatly help in maintenance by reducing research time. Issues can effectively be visualized and fixed. The current support requires a physical human personnel presence on site to better explain a problem and solution. AR can help with telecommuting. Technicians and experts can collaborate and see the same thing all the while sitting at their respective offices and guiding the engineer to fix the issues appropriately. This cuts down the travel costs significantly and moreover makes the support process much more convenient. Every great product that has rocked the markets has obviously gone through rigorous QA. Current QA requires human vision to identify problems but through AR digital overlays of products can be projected and inefficiencies can easily be identified. Through this technicians can identify the most minor issues with greater speed and accuracy. Exactly like industrial IoT where there will be deluge of IoT devices and sensors, AR will also be significantly be used in the industrial manufacturing process. The fact that intricate manufacturing tasks can be carried out easily, faster and in a more convenient way by using AR is a proof that it will increasingly be sought after. AR will enhance the manufacturing process such that it will be easier and convenient to carry out. All the buzz for AR is in gaming and entertainment but this is also a domain where it can really work wonders. As more and more sophisticated functionalities will be imbued in AR applications the ways how it can transform manufacturing processes will also increase. Interested in a collaboration? Have an AR project that you would like to discuss with us? Please fill out the form below. We’d love to hear from you! The biggest obstacle for AR app developers has been technology – consumer adoption of AR tech has largely been slow due to the low number of smartphones that can support AR experiences. However, all that is set to change with the slated release of the iPhone X, Apple’s latest and perhaps most eagerly awaited smartphone. The iPhone X is specially designed to bring augmented reality to iOS devices like never before. Here’s a look at some of the AR-ready features of the iPhone X.